Deskplates? They're GREAT profit makers! What's the biggest barrier to fund-raising? OBJECTIONS to what you're selling. People don't want to buy food because of a diet, for example, or because of concerns about their product arriving in good condition. School class fundraising often involves knick-knacks but most folks will choose the cheapest item. Candles are a problem for those with allergies, asthma or small children in the house. You can avoid these problems by selling DESKPLATES! You can select one, two, or three beautiful engraved deskplate styles and can then take orders from all of those who might have any of the above objections. In fact, deskplates are something that are great gift ideas for family members as well. Even if an individual doesn't want a deskplate for themselves, they'll surely know someone who would appreciate a thoughtful, personalized gift. We can set up your fund-raising program to YOUR group's special needs and you'll find that the profit margin you'll achieve is FAR better than many other programs. Our personnel are active in community activities so we know first hand the many ways that attempts to raise funds can go bad. With this program, you have ZERO investment in stock and UNLIMITED profits. These pins are great for high-profit sales since YOU set the price you'll charge - and every member will want at least a couple. Take a look at our custom lapel pin page which tells you all about the process and then call, email or write us: you'll be glad you did - and your group's Treasurer will as well! Commemorate your event with Photo Key Tags while fund raising! If you're in the Northern/Eastern Maine area, we'll be happy to develop an 'on scene' production of photo keytags that are sure to be a BIG hit. We provide the photographer and the equipment: you earn funds for your next event! Approximately 1/3rd of the retail price goes to your treasury. These tags are not only happy reminders of a memorable event but something that's sure to add excitement. Multiples are a great hit with friends and relatives. We'll keep the photos on file for several months so those who purchased them can get additional copies easily - and you continue to make profits well after the event! This is a great fund-raiser for your next 'dress-up' event or sports activity and we're happy to work with you. Give us a call and we'll check our schedule for photographer availability. 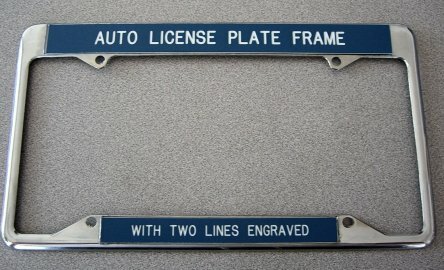 License plate frames make an excellent fundraiser! You can build school/club spirit, create support for your group, and make money in the process. Your members will LOVE them. Their friends and neighbors will buy them to support your group. We'll make this product with your colors and your text and you set the price you want to charge. Your profit will then mount as you can continue to sell this item on a long-term basis. We can drop ship for a small additional fee eliminating the need to deliver. No need for your group to carry an estensive stock: we'll produce them as you need them. Talk to us today about this great way to raise both funds AND visibility for your group! Fundraising custom designed for YOUR group! We have children of our own and we're part of community groups who regularly raise funds. We know how fund raising works! Give us a call today: we'll be happy to work with you to design a program that your members - regardless of age - will actively support. And we can even provide drop-shipment to buyers if you wish so that there are no problems with damaged goods at delivery time. The more you think about it, they more you'll find that our unique programs have SO many plusses. Give us a call TODAY and we'll work with you to design a fund-raiser that's short on difficulty and long on profits!